You might drink a protein shake to support lean muscle mass growth and weight gain. Protein shakes usually contain a combination of milk, protein powder and flavorings, such as fruit, nut butter or chocolate. Most protein shakes have between 20 and 40 g of protein, but you can easily increase this content by using additional scoops of powder and other ingredients that contain protein. Select a protein powder with about 24 g of protein per serving. Choose from whey, soy, casein and egg white. Opt for the one that fits your eating preferences and any intolerances or allergies you might have. Use any flavor that suits your tastes. Combine three scoops of powder with 2 1/2 cups of milk in a blender. Use cow’s milk because it has 8 g of protein per cup, compared to the 4 g found in 1 cup of soy milk. Add 2 tbsp. of peanut butter for another 8 g of protein. Whip the ingredients together on high speed. Pour into a large cup and consume. 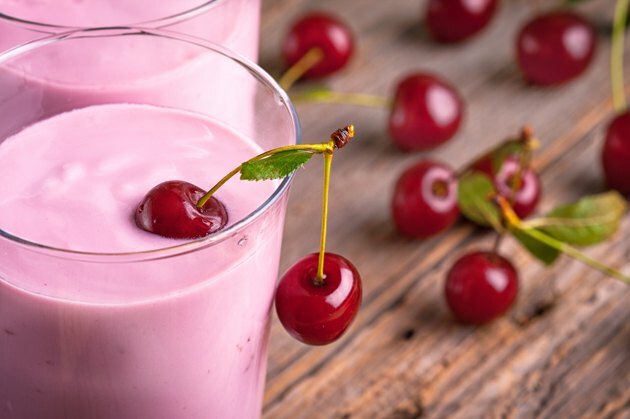 You can add fruit to the shake to change the flavor and texture. Bananas, mangoes and berries are common choices. Adding 1 1/2 cups of ice cubes will create a frosty shake. If you are drinking a protein shake to help with muscle growth, you must also lift heavy weights on a regular basis. Consume your shake around the time of your workout to help encourage muscle protein synthesis. When muscle synthesis is greater than the rate of muscle protein breakdown, you can experience muscle growth. Your body can only utilize 30 g of protein powder for muscle growth at one time, as demonstrated by a study published in the September 2009 issue of the “Journal of the American Dietetic Association.” In this study, participants who consumed 50 g of protein in one sitting experienced no greater muscle protein synthesis than participants who consumed 30 g of protein. The extra 20 g from your protein shake are excreted in your urine or used for energy. What Foods Combine to Make Complete Protein?